Before class make up cards that have different tasks children can perform. Make sure you print out enough cards so that each child will have five cards and you have at least ten cards left over for your card deck. Write one word from the Bible verse on each card. 1. Do - Share an example of good manners. 2. To - Tell the person on your right something nice about him or her. 3. Others - Say the Bible verse backwards. 4. What - Share a time when you didn't do unto other what you would have them do unto you and what you could have done instead. 5. You - Share what you will work on this week from the "Measuring Up" ruler activity. 6. Would - Trade one of your cards with the person on your left. Then discard this card. 7. Do - Discard this card and get two more cards. 2. 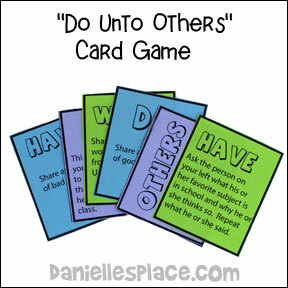 Have the children sit in a circle around the deck of cards with their Bible verse paper and a pencil. 3. Deal out the cards so that each child has five cards. Place the leftover cards in the middle of the circle face down. 4. 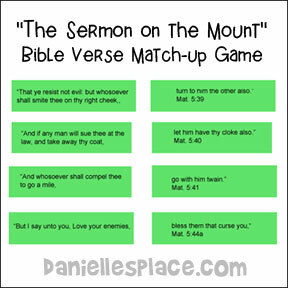 The object of the game is to circle all the words on your Bible verse paper first by completing the tasks on the cards. 5. To play the children take turns picking one card from the pile and placing it in their hands. A child picks one card from his hand and does what the card says to do. If the child does it successfully, he gets to circle the matching word on his Bible verse sheet that is written on the card he just read. When he is done, he discards the card in a discard pile. Then the next child takes a turn. 6. If a child does not have a card he needs, he can still use one of the cards from his hand, then discard it, and pick up a new card. 7. If you run out of cards in your deck, mix up the discard pile and turn it over for the deck. 8. 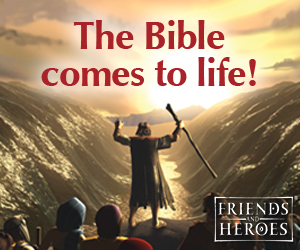 Keep playing until one child has circled all the words on his Bible verse sheet. Print the Bible verse on the paper leaving out the "Os". Have your children stick labels, or glue cereal to the paper where the "O's" belong. 1. 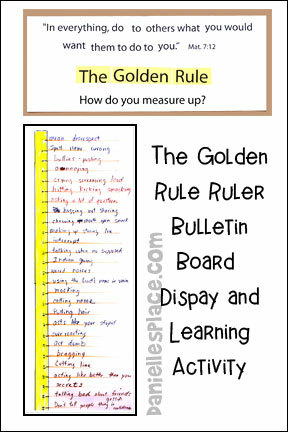 Before class print out the ruler patterns onto gold or yellow paper. 2. In class have your children cut the patterns apart and tape them together in the correct order. 1. Before class print out the match-up cards and cut the verses in half. Make enough sets so that every two or three children have a set. 2. In class divide the children up into groups of two or three and give each group a set of cards. See which team can match up the cards first. 1. Cut a large piece of poster board in half, lengthwise. 2. Print out the Bible verse and cut the words apart and glue them to the top of one piece of poster board as shown in the picture above. 3. 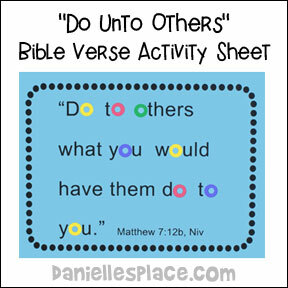 Print out "The Golden Rule" words, cut them out, and glue them to the poster board under the Bible verse. 4. Print out the "How Do You Measure Up?" 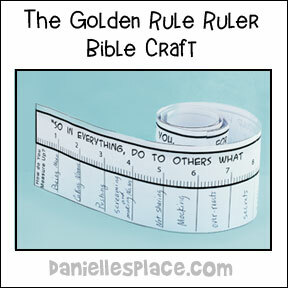 words, cut them out, and glue them under "The Golden Rule Title". 6. When you have filled in all the lines, show your children the poster and ask them what they think the Bible verse means? Tell them to take another look at the chart and ask them, "How do you measure up? Do you do these things?" Tell them to work on "measuring up" during the week. 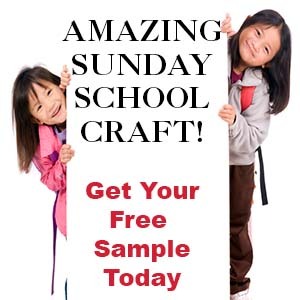 Attach the finished chart and poster to your bulletin board. Read "Do Unto Otters: A Book About Manners"
Mr. Rabbit has some new neighbors who are otters, but he has never met any otters before and doesn't know how to treat them. He gets some great advice from Mr. Owl, "Do unto otters as you would have them do unto you." This inspires Mr. Rabbit to ask himself, "How would I like otters to treat me?" He came up with a lot of ideas; they should be honest, keep their promises, not lie, not cheat, they should apologize when they do something wrong, and forgive me when I do something wrong, etc. I found this book in our local library. Although it may seem a little young for older children, the cartoon characters and funny remarks will also appeal to this age group. The Berenstain bears are great at teaching children 4 - 7 biblical concepts. Don't miss The Berenstain Bears faith-based series including: The Berenstain Bears and the Truth, The Berenstain Bears Say Their Prayers, The Berenstain Bears and the Golden Rule, and The Berenstain Bears: God Loves You! Your children will loves these books.